Keywords: Emissions, Petrol, motorized vehicles. Technology 10(1), 2019, pp. 326–334. cities in the world is supported by the development of transportation technology. effects that are harmful to human survival. controlled. One of the human activities that pollute the air is transportation activities. thresholds. Vehicles with different ages and types of fuel will produce different emissions. Sahupala, 2018; Maulany et al., 2018; Samudro et al., 2011; Waremra and Bahri, 2018). 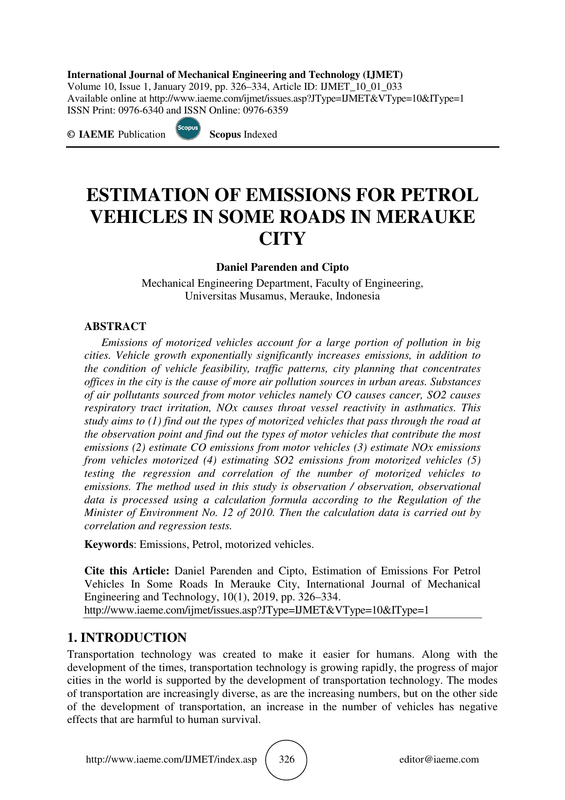 potential to affect air quality which is a danger to the health of residents of Merauke city. based on the number and type of motorized vehicles. research, namely: Jalan Brawijaya-Brawijaya Circle with a length of 200 meters; ParakoLingkaran Brawijaya Road is 200 m long; and TMP-Circle Brawijaya Road for 200 meters. which is the location of the study is shown in Figure 1 below. constant average vehicle speed and facilitate observation. the value of Y. (Wendy C Sihombing 2017). observation locations is as shown in Figure 2.
dominate, and the highest traffic volume on the Parako - Brawijaya Circle segment. motorcycle on the TMP Road - Brawijaya Circle reaches 84.80%. the volume of vehicles on the highway at the same time. observing 200 meters along the Parako - Lingkaran Brawijaya Road Section; Brawijaya Brawijaya Circle; TMP - Brawijaya Circle, is as presented in Figure 3.
vehicles are 40 grams / km. TMP - Circle Brawijaya, is as presented in Figure 4. TMP - Circle Brawijaya, is as presented in Figure 5.
motorcycle vehicles, 0.026 in car vehicles. Hour, on the Brawijaya-Circle Brawijaya road segment, 3.17 Kg / Hour, and on the TMPCircle Brawijaya road segment 4.18 Kg / Hour. Brawijaya road segment 0.11 Kg / Hour. Hour, on the Brawijaya-Circle Brawijaya road segment, 0.0019 Kg / Hour, and on the TMPCircle Brawijaya road 0.0025 Kg / Hour. Journal of Mechanical Engineering and Technology, 9(10), pp. 295–303. Engineering and Technology, 9(8): 580–584. Seminar Int Mobil Listrik Ditjen Dikti, Kemendikbud. Maulany, GJ; Manggau, FX; Jayadi, Waremra, RS and Fenanlampir, CA. (2018). International Journal of Mechanical Engineering and Technology, 9(11), 2018, pp. 21–27. concentrations at two meters above the ground for greenspace assessment in Surabaya. Middle East Journal of Scientific Research 18(3), 288-292. Dan Kota. Universitas Diponegoro. Semarang. Journal of Mechanical Engineering and Technology 9(10), pp. 72–76. Bermotor Di Kota Semarang. Skripsi. Jurusan Perencanaan Wilayah Dan Kota. Case of Xiían City, P.R.China.